We are very proud and excited to be co-sponsors along with the ACGCC and Literature and the Environment for the first conference hosted at UCSB by, for, and about LGBTQIA+ graduate students. 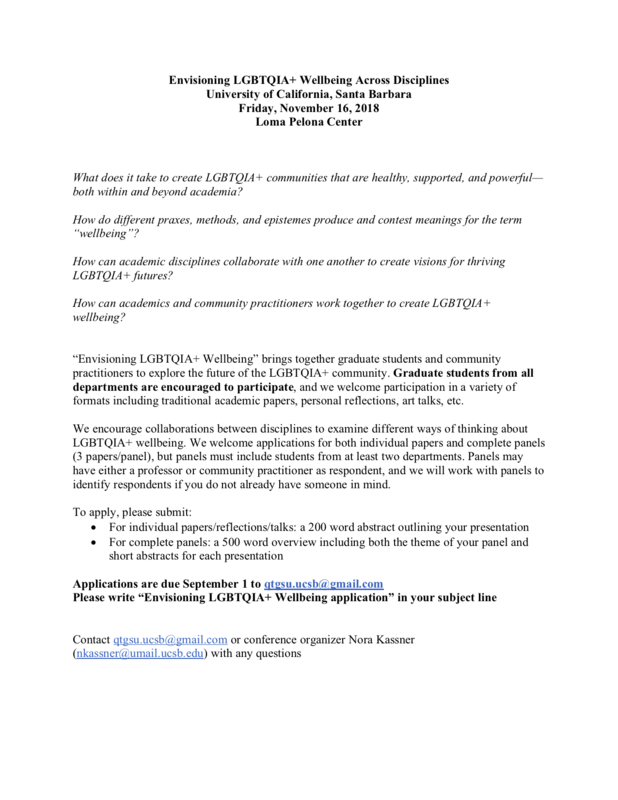 This year’s “Envisioning LGBTQIA+ Wellbeing Across Disciplines” Conference organized by the Queer and Trans Graduate Student Union (QTGSU) aims to create community on the UCSB campus, share radical scholarship, and envision a desirably queer future. The conference will be held November 16th, 2018 at the Loma Pelona Center. Please join us May 3, 2018 at 12:30-1:45pm in South Hall 2623 (Sankey Room) for a pre-mini-International Congress on Medieval Studies Conference! 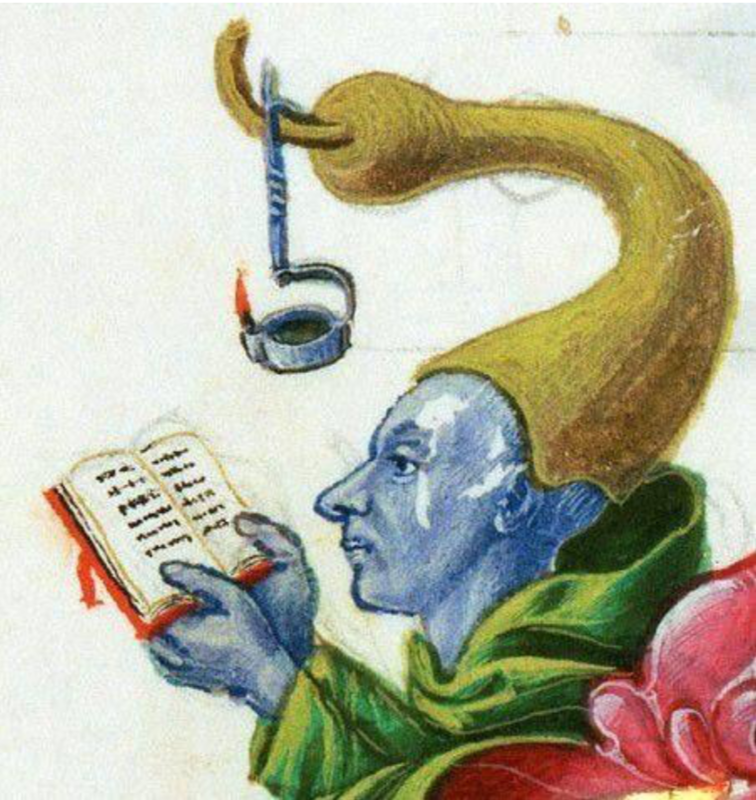 The UCSB Medieval Literatures Center will be previewing the work of University of California Santa Barbara medieval graduate students. Come hear our exciting new research before it goes on the road! Please contact Medieval Literatures Research Assistant Joyce King (jlking@umail.ucsb.edu) for more information. 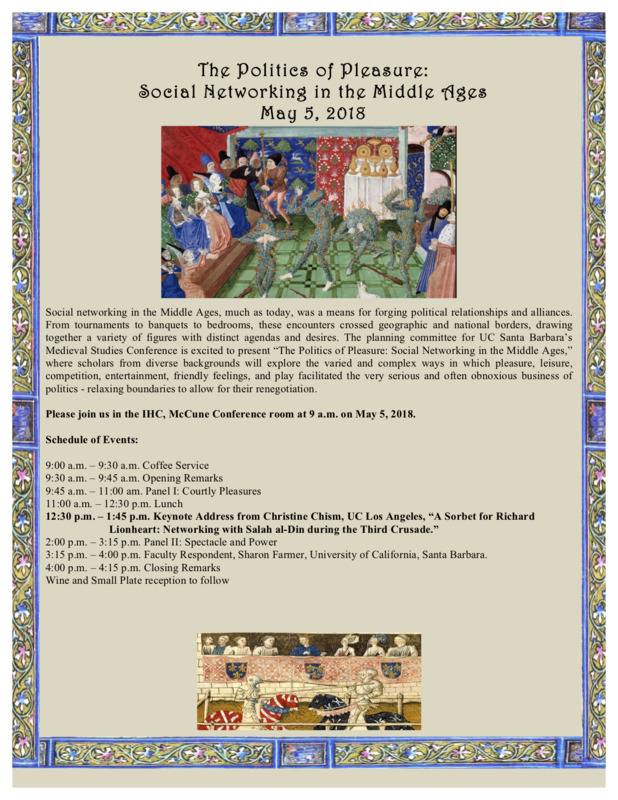 The UC Santa Barbara’s Medieval Studies Graduate Student Conference 2018 planning committee is excited to present “The Politics of Pleasure: Social Networking in the Middle Ages,” where scholars from diverse backgrounds will explore the varied and complex ways in which pleasure, leisure, competition, entertainment, friendly feelings, and play facilitated the very serious and often obnoxious business of politics – relaxing boundaries to allow for their renegotiation. The Keynote this year will be presented by Professor Christine Chism from UCLA. Our very own Professor Sharon Farmer will be delivering the closing responses for the papers. Please join us on May 5, 2018 at 9:00 a.m. in the IHC McCune Conference Room. There will be refreshments throughout the day, lunch, and a wine and small plate reception at the end. 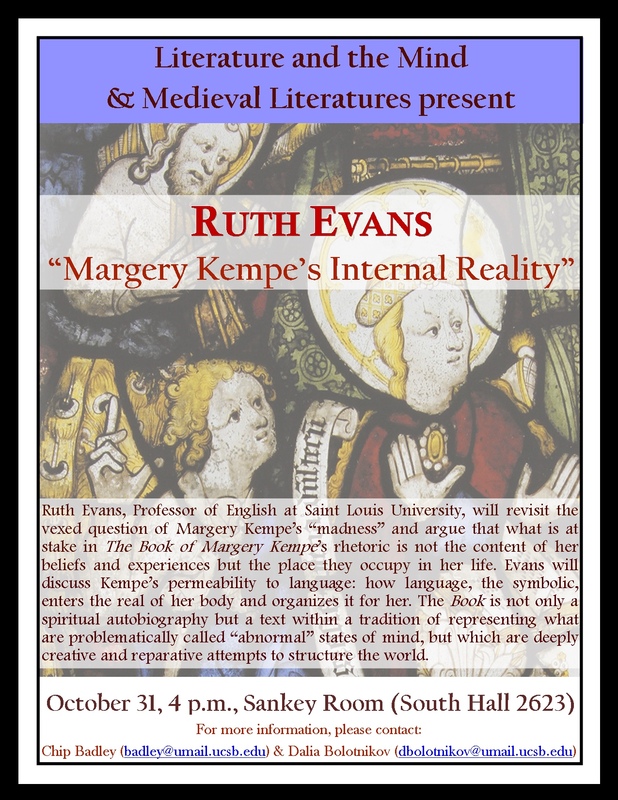 Please join us for a talk by Ruth Evans, Professor of English at St. Louis University, on October, 31, 2017 at 4pm in South Hall 2623 (Sankey Room) on “Margery Kempe’s Internal Reality”! 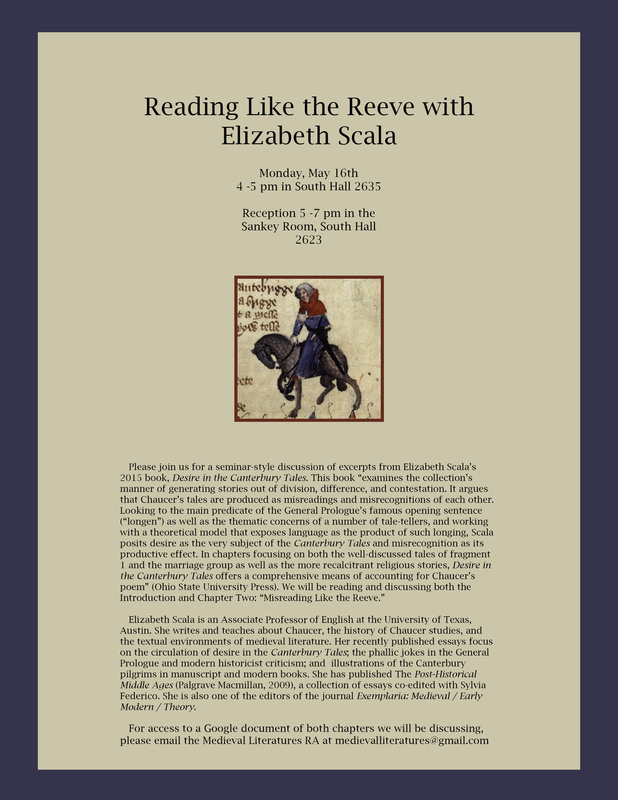 Co-sponsored by UCSB’s Medieval Literatures and Literature and the Mind research centers.